Join Office 365 experts at SharePoint Summit 2019 in Tel Aviv and Reston, VA this week. With Office 365 and SharePoint, Microsoft offers tools for better productivity than ever before. But are we using the platforms to their full potential? For years, Office 365 and SharePoint have helped organizations achieve more and streamline their business processes. They’ve been instrumental in the pursuit of ‘digital transformation’; an ongoing process which sees businesses embracing new technology and work practices to solve traditional business problems and embrace new ways of thinking. As powerful as they are, however, the platforms alone can’t guarantee a smooth transformation to the Digital Workplace. Without considering the daily user experience of today’s knowledge workers, organizations will not be able to reap the benefits of SharePoint or Office 365. What is the SharePoint Summit 2019? The SharePoint Summit 2019 events are one-day seminars intended to help Microsoft professionals stay on top the latest Office 365 and SharePoint developments and gain practical insight about how to take advantage of them. There are 13 SharePoint Summits planned for 2019. 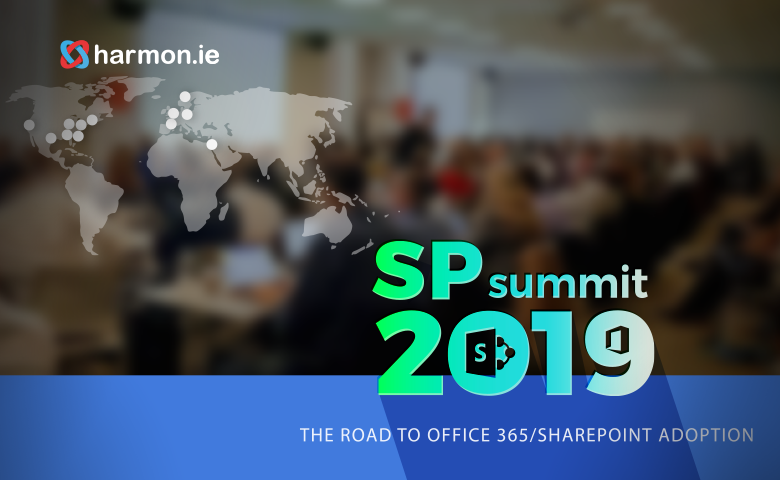 As the host sponsor, harmon.ie is spearheading this initiative to bring together industry leaders and experts to discuss developments in Office 365 and SharePoint and provide advice on how to improve adoption. With educational sessions, Q&A sessions, demonstrations, and more, the summits offer the chance to learn from industry experts and network with likeminded peers. Held in Microsoft facilities and co-sponsored by Microsoft, the events feature sessions and panels from a Microsoft keynote speaker, as well sessions from Microsoft experts from Nintex, AvePoint, and local systems integrators. These SharePoint Summits present the opportunity to learn more about the role that Office 365 and SharePoint are playing in the current technology landscape, the coming updates and changes, and the strategies you can take to make the most of them. April rings in the opening of the SharePoint Summit season. On April 3, the Summit takes place at Microsoft Israel, featuring a keynote speech from the former GM of Microsoft Israel R&D, Yoram Yaacovi. He’ll discuss The Future of Technology and Work. Other speakers at this event include Yaacov Cohen, co-founder and CEO of harmon.ie, who will discuss the Microsoft Graph and the keys to overcoming information overload. He’ll be followed by speakers including Yair Dembinsky, CEO of local SharePoint user group Know-edge; and Nati Papirovitch, SharePoint MVP & Senior SharePoint and Office365 Consultant. You can find an agenda here; you can register to attend here. The same day, April 3, a SharePoint Summit will also be held at the Microsoft Technology Center (MTC) in Reston, Virginia. Ed Hild, a Technical Architect at Microsoft, will give the keynote speech about “Everyday AI in Microsoft 365.” As Microsoft apps become more intelligent, they’ll provide new possibilities for businesses, so this is a must-attend speech. harmon.ie’s Chief Product Officer David Lavenda will discuss how to overcome information overload inherent in Office 365, followed by Adam Levithan, Principal – Product Management at Withum and Microsoft MVP, and many more. You can find an agenda here and register to attend here. To ensure that your organization is makes the most of Office 365 and SharePoint, register for a SharePoint Summit near you. These are the perfect opportunity to gain industry insights and plans your digital transformation. We’ll share agendas for coming events on our website in the next few months, so make sure to check back for more details. Register for our events today to ensure that your business is always one step ahead of the competition.